Don't judge a book by its cover. This is a familiar idiom often applied figuratively in social situations and literally when deciding which book to buy when all you have to consider is the book jacket. This idiom is also true for tea. I was the recipient of several puerhs from Liquid Proust aka Andrew Richardson. 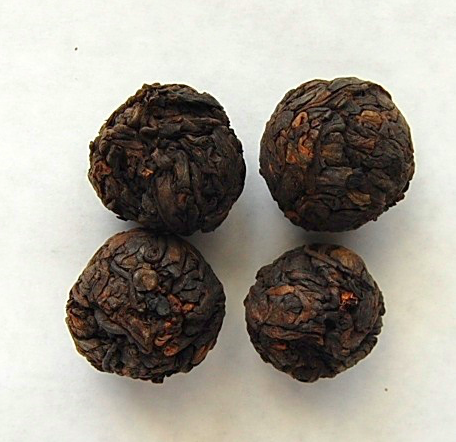 One of the puerhs was a ball of 2007 Menghai Yunhai. The ball was wrapped loosely in paper. It was not dried out, there was give when I applied pressure to the ball. The smell of the ball was not promising. It had musty and dusty odors. The age was the most exciting thing about this ball. It's the oldest puerh I've ever had in my tea stash. I drank this tea with one of my ITEI tea school instructors, Christine TN Wong. My apologies for not having more photographs. Going into the tasting session I did not intend to publish my notes here and also it is difficult to photograph an instructional tasting session as it is occurring. My ball weighed 6.62 grams. The Puerhshop website lists the weight as 5 grams. The leaf aroma was dusty, musty, with slight mushroom scent. The ball was not brittle. The leaf color was dark though note the reddish streaks in the top photo. After a rinse, I infused the ball in a 120-125mL gaiwan in filtered tap water at 212F at 45s, 60s, and 75s. The ball unfurled to reveal leaves of at least 1 inch in length. The leaves were consistently inky and dark. The leaves smelled of root vegetables and tubers such as beets and yams as well as peat and smoke. The first infusion yielded a dark orange red liquor. The tea had depth, it stuck to the cheeks and roof of my mouth. Like a good wine, the liquor had thick "legs" in the gaiwan. The taste was full of lots of earth and soil. Also it was sweet, the sweetness of roasted tubers and root vegetables, and carob chips. As the tea cooled, the flavor was detectable in my throat. A bit chalky note emerged, too. 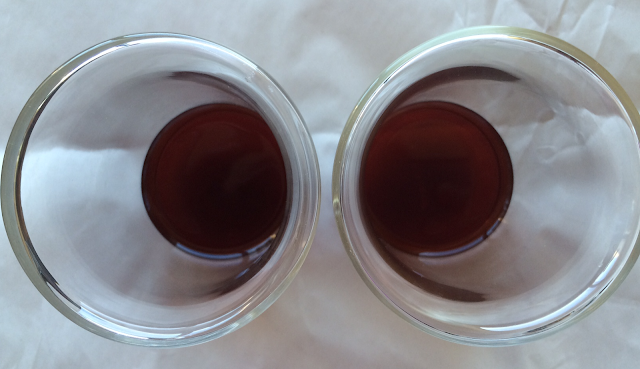 The second infusion produced a coffee black liquor. It was much thicker liquor than from the first infusion. The flavor profile shifted producing tart, dark fruit. The chalkiness remained, like a baking chocolate. The liquor was round and balanced, overall delicious. There were no sharp edges. The tea became creamy as it cooled and revealed a slight nuttiness. The roasted root flavors were not as pronounced. The earth and soil flavors dominated the end note. I did not drink the third infusion immediately. I was talking with Christine and the liquor cooled off. The bright, robust flavors in the second infusion were not as evident. Having said that, the flavors lingered on the roof and in the back of my mouth, not my cheeks. It coated the back of my mouth and top of my throat. Christine described this coating effect as a push or force and it reflects the intensity of the aftertaste. One really exciting feature of this infusion is that I identified a smell I first detected in the second infusion. The infused leaves smell like the preparation of banana porridge. This is a childhood smell, and I love (and miss) it! Shou puerh is still not my first choice of tea but with each good experience, my appreciation grows.